Ethiopia is located in eastern Africa. Ethiopia is bordered by Eritrea to the north, Sudan and South Sudan to the west, Kenya to the south, Somalia to the south and east, and Djibouti to the east. 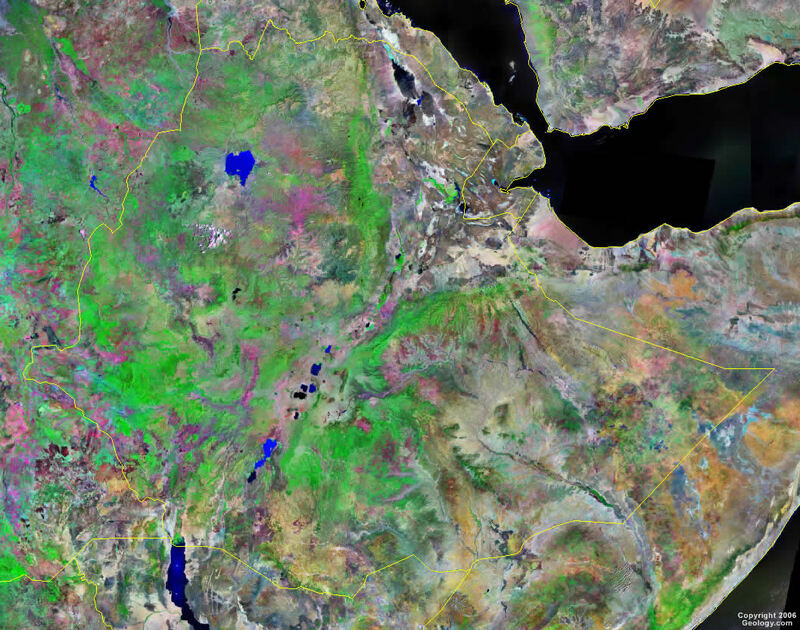 Google Earth is a free program from Google that allows you to explore satellite images showing the cities and landscapes of Ethiopia and all of Africa in fantastic detail. It works on your desktop computer, tablet, or mobile phone. The images in many areas are detailed enough that you can see houses, vehicles and even people on a city street. Google Earth is free and easy-to-use. Ethiopia is one of nearly 200 countries illustrated on our Blue Ocean Laminated Map of the World. This map shows a combination of political and physical features. It includes country boundaries, major cities, major mountains in shaded relief, ocean depth in blue color gradient, along with many other features. This is a great map for students, schools, offices and anywhere that a nice map of the world is needed for education, display or decor. 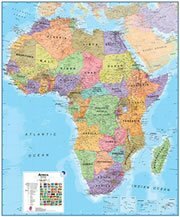 If you are interested in Ethiopia and the geography of Africa our large laminated map of Africa might be just what you need. It is a large political map of Africa that also shows many of the continent's physical features in color or shaded relief. Major lakes, rivers,cities, roads, country boundaries, coastlines and surrounding islands are all shown on the map. Adis Abeba (Addis Ababa), Agaro, Arba Minch, Awasa, Bahir Dar, Bati, Debre Markos, Debre Tabor, Dese, Dila, Dire Dawa, Dolo Bay, Gimbi, Gonder, Harer, Jijiga, Jima, Kibre Mengist, Mega, Mek'ele, Nagele, Nazret, Nek'emte, Sodo, Wendo and Werder. Abaya Hayk', Abhe Bid Hayk', Abiyata Hayk', Akobo River, Awash River, Blue Nile River, Ch'amo Hayk', Chew Bahir, Dawa River, Fafen River, Gemeri Hayk', Genale River, Gulf of Aden, Jerer River, Lake Turkana (Lake Rudolf), Langano Hayk', Red Sea, Shala Hayk', Shebele River, T'ana Hayk', Wabe Gestro River, Wabe Shebele River and Ziway Hayk'. Ethiopia's mineral resources include small reserves of gold, copper and platinum. The country has other important natural resources, which include potash, natural gas and hydropower. In Ethiopia, the geologically active Great Rift Valley is susceptible to earthquakes and volcanic eruptions. Frequent droughts are another natural hazard in this country. Environmental issues for Ethiopia include: deforestation; overgrazing; soil erosion; desertification. There are water shortages in some areas from water-intensive farming and poor management.